And a belated Merry Christmas to you all! Hope you had a good Christmas Day, myself and my other half came down with something on Christmas Eve (not sure if food poisoning or a bug, myself I suspect the former) so we were pretty much out of that all that day and although we had a good time on the big day itself we did both go for a nap mid-afternoon! Spoiler alert - after the picture below I'm going to talk about the Downton Abbey Christmas Special. 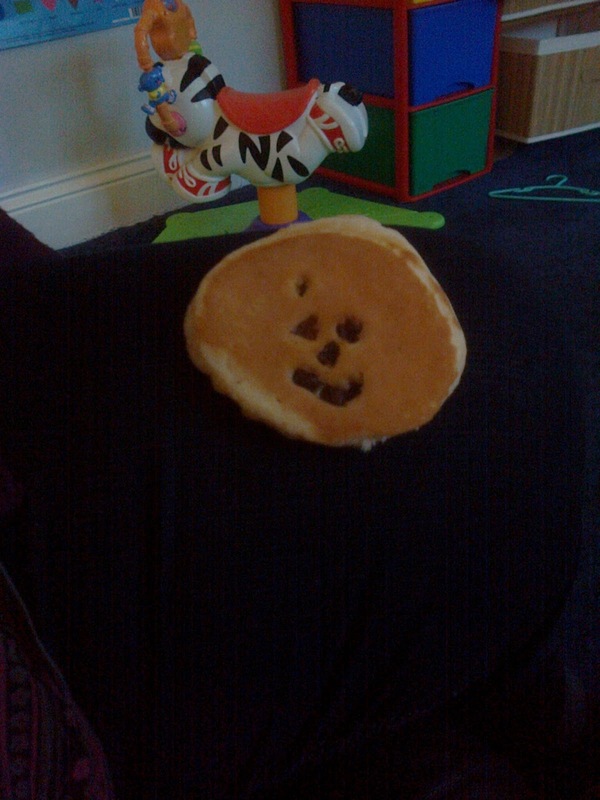 It's a pancake! And the raisins make a face!!! O. M. G.
My other half likes these pancakes you can get with raisins in that can be eaten cold or toasted. Anyway this one the raisins made a face. Anyhow, Downton Abbey. I saw the Christmas special last night, very much enjoyed it as always. But the end - and I'm delaying saying about it in case someone who hasn't seen the episode but is planning to is reading this - was a shock. Almost as an afterthought, Matthew gets killed (presumably) in a car crash. Certainly the blood gliding down his blank face can't be beneficial for his health. Downton Abbey is no stranger to death - the show kicked off with the sinking of the Titanic taking out the obvious male heirs, and over the years we've seen regular crew Lady Sybil and William die, along with the attache to the Ottoman Empire. My first reaction was to criticise the show for killing Matthew so randomly and swiftly and as one of the nicest characters in the show he'll be sadly missed. However, thinking about it does this only go to show how good the series is, to make me care about the characters in this way? And I can't argue that Matthew's death isn't historically likely - although national road accident statistics weren't collected in 1921 (when the episode was set), in 1926 they did begin to, and in that year 4,886 deaths were recorded. To give this figure some detail, in 2011 the number of deaths was 1,901, despite the fact that the daily flow of motor vehicles has increased by some 150% over the forty years from 1965 to 2008 (can't find statistics going back beyond that but I can't imagine traffic has lessened pre-1965). Of course 1,901 is still far too many deaths - 1 is too many - but it does show that we are more careful on the roads today (as well as roads being better controlled, better emergency response systems etc). I suppose my only concern is that the show has so many ups and downs and surprises and twists that it almost feels more like an episode of Eastenders (which I was a fan of for many years until the Sunday omnibus vanished from afternoons) than a period drama. But does that matter? At any rate I will be watching the fourth season when it arrives to give me more to blog about!